The most advanced and highest-quality horizontal juicer on the market. Use to remove dirt and loose skin, rinsing and cleaning carrots, parsley root, turnips, and many other vegetables. Great steak knife from Stainless steel. Compact digital scale with an elegant design. Additional one year of warranty for this product. High quality peeler for fruits and vegetables. Cleaning brush for fruits and vegetables. Special cleaner for cleaning juicers and citrus juicers. It´s not possible to send this product outside of EU, Norway, Switzerland and Cyprus. All service labor needed for the lifetime of the product is free of charge. Only spare parts need to be purchased. Free shipping to all continental EU countries. For other countries, shipping costs will be shown in the cart. The Sana EUJ-707 is the result of a collaboration between the American company Omega and the European company Sana. Omega has a long reputation for making some of the best juicers in the world, and Sana combines that expertise with products designed especially for European consumers. These two companies collaborated to create the best juicer for the Euopean market - the Sana EUJ-707. The Sana 707 was designed to combine functionality into a pleasing design. The end result is beautiful. The soft curves and absence of hard edges really make this juicer stand out in a good way. Every aspect of this juicer is top quality. The materials used in its construction are best in class. The workmanship is superb - everything is manufactured to very fine and precise tolerances. It is obvious when you see this machine first-hand that it is extremely solid and well-built. And it's the only premium juicer available in a wide variety of colors. With 11 designer shades in three series - gloss, pastel, and matte - there is a color for every decor. 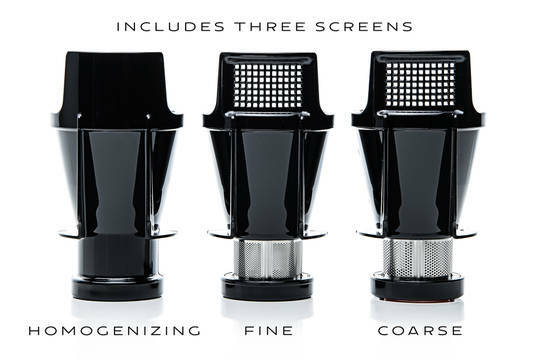 It comes with two types of juicing screens. 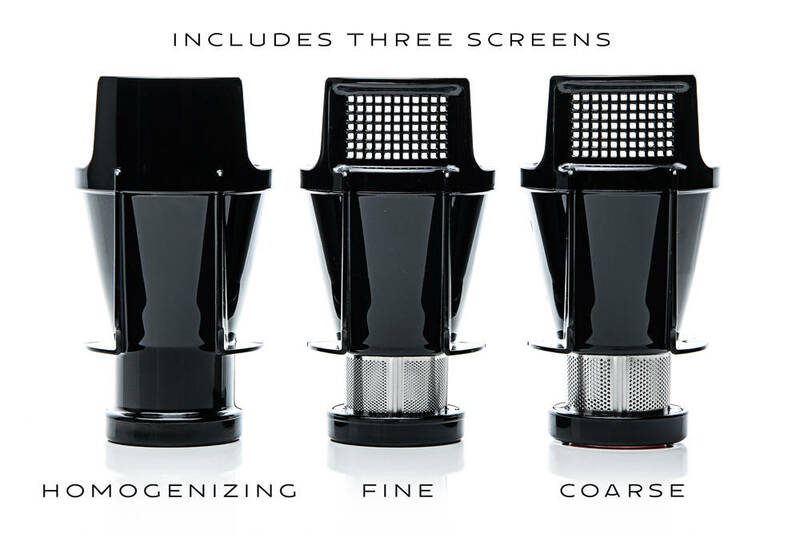 Most horizontal juicers only have one juicing screen, plus sometimes a blank homogenizing screen. The Sana EUJ-707 includes both the standard fine juicing screen which makes very fine, clear juice, as well as a coarse juicing screen which makes a denser juice with more pulp. This coarse screen also allows it to work with softer fruits like berries and pineapple, something other horizontals do not handle. It also includes a homogenizing screen to make things like sorbet, nut butter, baby food, nut milk, pasta, salsa, and much more. The Sana 707 was designed to be as user-friendly as possible. It has few parts, no hard corners or hard-to-reach places. Cleaning the machine after juicing takes only 2-3 minutes - just rinse it under running water, and use the included brush to remove any pulp from the juicing screen. 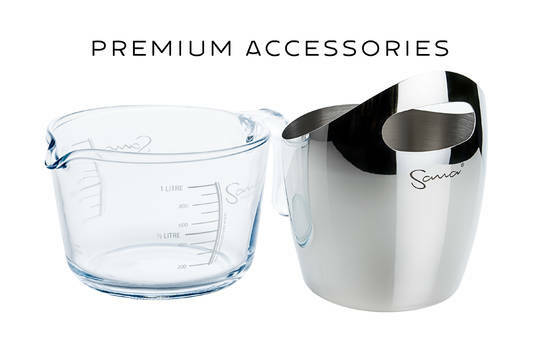 Make your own cold-pressed oils from a wide variety of seeds and nuts with the new stainless-steel Sana oil extractor. 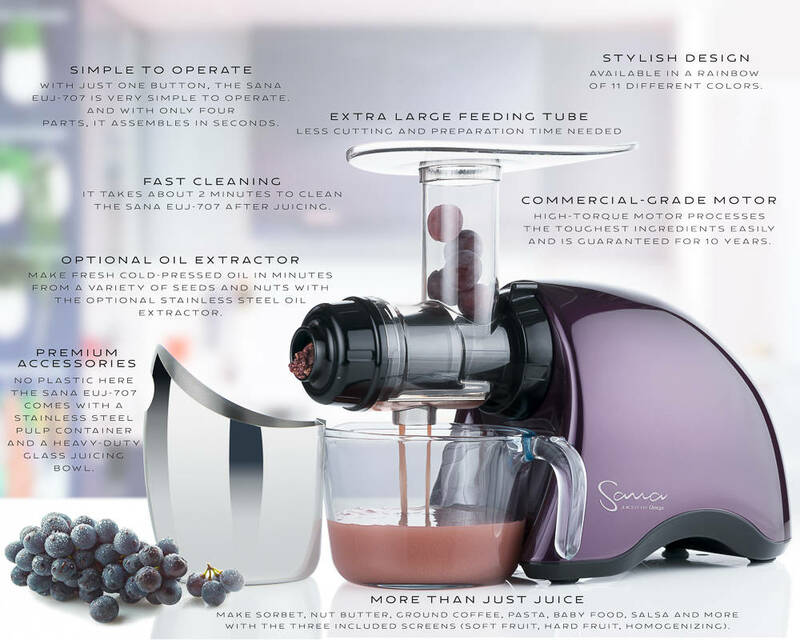 It was designed from the ground up to work perfectly with the Sana 707 juicer. Click here for more details. Ask us now in discussion. Attachment for horizontal juicers lets you make your own fresh cold-pressed oils fast and easily. Please, tell us the pros and cons, one per line. However, if you can't think of anything, you can leave it blank. I was considering vertical or horizontal juicer quite a long time and I´m really happy I chose the horizontal one. It seems much more versatile and it´s super easy to clean it after using. Moreover I would like to buy oil press attachment in the future so Sana by Omega EUJ-707 was the right choice for me. I´m very satisfied with Sana and use it every day. Maybe there could be a bit higher yield with hard vegetable but in general the yield is really good. I had the chance to see a few juicers made in China and the quality of Sana is definitely much better. I like the after sales service and availability of spare parts. HALLO:) I live in Sweden,/ Göteborg, how long time I will be wait for delivery? We ship from our central warehouse in the Czech Republic, normally via UPS or DHL. It would take approximately 3 days to arrive after shipping. A quick way to clean produce before juicing. High quality stainless steel peeler for fruits and vegetable. Special brush designed for removing dirt and residues from vegetable. The best way to keep your juice or smoothie fresh. Includes vacuum pump. Professional hygienic cleaner for juicers. Cleaning Brush for Sana Juicers and Omega Juciers. Drum Seal for Sana EUJ-707 / EUJ-606. Pusher Seal for Sana EUJ-707 / EUJ-606. Drum Cap seal for Sana EUJ-707 / EUJ-606. Pusher for Sana Juicer EUJ-707 / EUJ-606. Strainer for Sana Juicer EUJ-707. Pasta set for Sana Juicer EUJ-707. 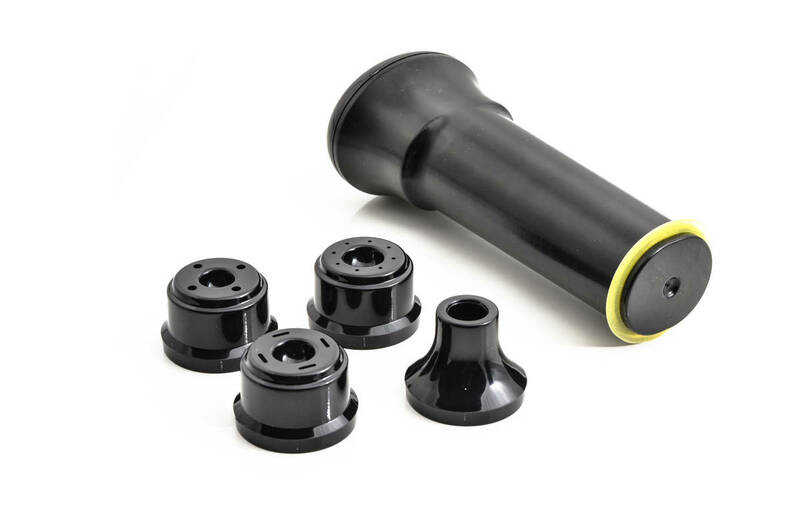 Drum Cap for Sana Juicer EUJ-707. Glass Juicer Container for Sana Juicer EUJ-707. Stainless steel pulp container for Sana EUJ-707. Blank screen for Sana Juicer EUJ-707. Fine screen for Sana Juicer EUJ-707. Coarse screen for Sana Juicer EUJ-707. Drum for Sana Juicer EUJ-707. Auger for Sana Juicer EUJ-707 / EUJ-606. Sign up for our newsletter from EU Juicers and Sana Store to receive new product information, discounts, and tips for using our products. Information notice:According to the Act on Registration of Sales, the seller is required to issue a receipt to the buyer. The seller is also required to register the sales data online to the Financial Authority. In case of a technical problem, the data must be registered no later than 48 hours after the sale.